Alongside all of the the heartbreaking news coming out of the midwest over the devastating tornados that swept the region last week, a glimmer of hope has emerged in the form of one very luck black cat. Henryville, Ind. resident Marilyn Walden was at work when the tornado struck, and recently returned to her home with friends and a camera crew from The Weather Channel to search for her missing cat, Bear. 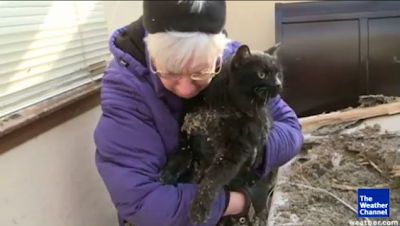 Although her home was destroyed, Walden broke down into tears as she pulled the 5-year-old cat out from underneath a bed where he had taken shelter. The handsome boy looked to be in good shape, despite being caked in dirt. This isn't the first time a kitty hid out from a storm, only to make its grand reappearance on live television: In one of the most heartwarming videos of 2011, Judy Pugh's cat Cadie emerged from the wreckage of her Tuscaloosa, Ala. home, as cameras rolled on. Absolutely heartwarming, I definitely had tears in my eyes after seeing this. I could not imagine my kitty, Petunia, being lost after a Kansas tornado. Such a great ending. Pawsitively inspiring. She seems like a dear sweet lady!